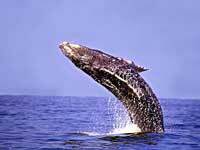 From mid-December through March, Puerto Vallarta is home to humpback whales, who come down to the tropics to calve. Often we'll see baby humpbacks, along with the adults breaching near the boat. All year, dolphins inhabit the Bay of Banderas as well as manta rays and sea turtles. The essence of the Whale Photo Safari is to find the wildlife and enjoy those precious moments when you can sit peacefully and watch the whales and dolphins play, breach, eat, or just hang out. We'll look for and enjoy the whales up close and personal, giving you multiple photo opportunities. Runs: Mondays and Thursdays at 8:00AM from Nuevo Vallarta or 8:30AM from Marina Vallarta. Tour runs ONLY December through March. Sunscreen - There is no cover on the boat! Camera - Don't Forget This! No restrooms on boat - go before you leave! Departs From: Marina Vallarta and Nuevo Vallarta. Directions will be included with your confirmation. Kids: Ages 12 Years and Up. THIS TOUR IS NOT AVAILABLE, BUT WE HAVE ALL THE BEST WHALE WATCHING TOURS STILL AVAILABLE FOR BOOKING (IN SEASON)! OUR ADVICE: Seeing breaching, calving humpback whales is an experience not to be missed. 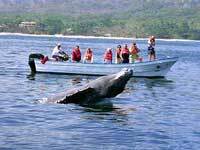 If you're in Puerto Vallarta between December and April, make sure to go out on the water and see the spectacle.